An online petition calling for the BBC to reinstate TV presenter Jeremy Clarkson after he was suspended for allegedly attempting to punch a producer has attracted over 300,000 signatures. The controversial presenter of long-running motoring show Top Gear allegedly punched a producer after he “saw red” in what has been described as a “fracas” during filming for the show in Newcastle. The producer involved was named by the Daily Mirror as Oisin Tymon. The newspaper reported that Clarkson “snapped” when he found out his dinner was not ready. 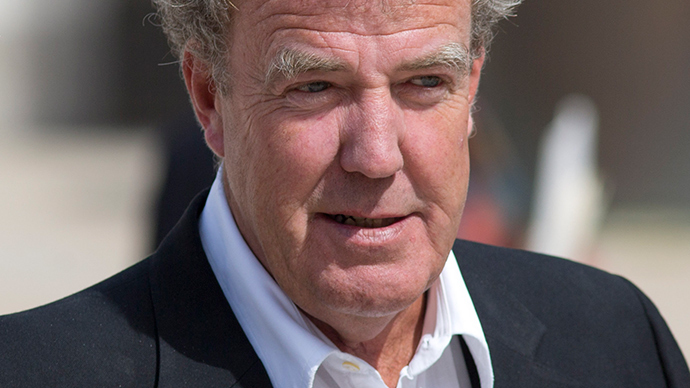 Clarkson’s behavior was reported to the BBC on Monday and he was suspended Tuesday morning. The remaining three episodes of the current series of Top Gear have been removed from TV listings and the BBC has not confirmed whether it will return. One source told tabloid newspaper The Sun: “Jeremy had a massive bust-up with one of the male show producers and he ended up smacking him in the face. Everyone was absolutely stunned. The BBC is believed to have banned staff from talking about the “fracas” as it has the potential to result in a grievance procedure. Save Clarkson? Save empty cardboard boxes and off-cuts of string. They're far more useful. The corporation currently owns the rights to the format of the show, which they bought off Clarkson and his producer Andy Wilmot in 2012, but it is unclear whether co-hosts Richard Hammond and James May could continue if Clarkson was sacked. His suspension has been greeted with joy and outrage, with his critics calling it a victory for the broadcaster, while his fans rally in protest. The “Top Gear Forever” Facebook page has over 7,000 likes and is gathering support for the disgraced presenter. The petition to reinstate him, reportedly set up by political blog Guido Fawkes, has garnered over 300,000 signatures. The alleged incident is the latest in a series of gaffes for the presenter, who has caused controversy with allegedly “racist”comments and inappropriate behavior. Last summer the Top Gear presenters were chased out of Argentina following protests about the number plate of Clarkson’s vehicle, which read H982 FKL in an apparent reference to Britain’s victory over Argentina in the 1982 Falklands War. Just seen large queues of people wearing purple and yellow outside @bbc Broadcasting House - Must be auditions for new Top Gear presenter. Clarkson denied the claims and said the registration plate was an innocent coincidence. Clarkson said he was “horrified” by the allegations.